Leeds United have sealed the permanent signing of Liam Bridcutt today after agreeing a two-year contract with the midfielder. Bridcutt underwent a medical yesterday and was today unveiled as United’s ninth signing of the summer ahead of tonight’s game against Fulham. A deal to bring Bridcutt back from Sunderland after his successful loan last term had been on the cards throughout the summer but complex talks over the severance of his contract at the Stadium of Light prevented Leeds from completing the transfer before the start of the season. Sunderland and Bridcutt eventually reached an agreement to sever his £26,000-a-week deal last Thursday but the move was held up again as the 27-year-old and United worked to thrash out personal terms over the weekend. “It feels good to be back,” Bridcutt told leedsunited.com. “It’s been a long time coming but now I’m really glad to be here and I’m just looking forward to playing football again. “I enjoyed myself here last season. The boys made feel very welcome and it’s a club I’ve enjoyed playing for. “I was very happy here and there was a persistence from Leeds this summer which made me feel wanted, and that’s always a good thing. “The fans were also a key aspect of me signing here again. They were brilliant with me last year – I felt like I connected with Leeds as soon as I came here and it was a team I wanted to play for. “Every time I run out for Leeds I’ll give 110% and I’ll aim to get better each week. I just can’t wait to get back out onto the pitch.” The Scotland international was willing to take a large cut in salary to return to Elland Road on a full-time basis and the terms of a two-year deal were finalised yesterday afternoon. Bridcutt operated as a defensive midfielder to good effect at Leeds last season, joining initially on an emergency loan in November before extending that deal through to the end of the term. The ex-Brighton player has not featured for Sunderland since the end of the 2014-15 campaign and his omission from Sunderland’s pre-season tour of France last month was confirmation that the Premier League side were committed to moving him off their wage bill. The centre of midfield is one of the areas of United’s team identified by Monk as a priority for strengthening and the deal for Bridcutt comes as a boost after a poor start to the season. 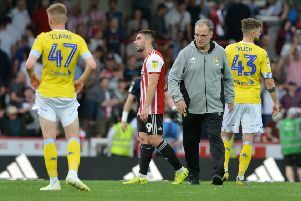 Monk cut a deeply frustrated figure on Saturday aa a poor second half condemned Leeds to a 2-1 defeat at home to Birmingham City. Leeds had opened their campaign six days earlier with a 3-0 loss at Queens Park Rangers. Bridcutt’s move has gone through less than a week after United signed versatile right-back Luke Ayling from Bristol City.